When originally thinking about technology in the Ninth World, I mostly thought in terms of how it was used, and thus created cyphers, artifacts, oddities, and discoveries. 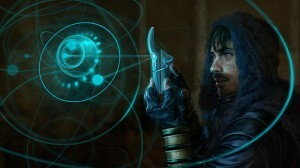 These categories are useful to show how a PC interacts with the numenera–how it is (or isn’t) useful to them. As I began actually writing, I found that there’s another way to slice that particular pie: by origin and appearance. This approach didn’t occur to me until I started trying to describe numenera items to players in my playtest. It started to become very clear to me, however, when I started to explain to GMs in the text how to portray numenera in their campaigns. I realized that, when it comes to devices that characters are likely to carry around with them and use, there were four types. Scavenged: The most basic type of device is the one pulled out of some ancient ruin. It was either a complete device, found intact, or a portion of another device, removed by some learned person, which can then be used for a function all its own. The former might be a bracer-like device with some touch-sensitive controls that the wearer can manipulate in order to create and control a powerful magnetic field around himself. The latter might be a viewscreen from some vast machine that all by itself allows the user to see through up to one inch of normal matter. Cobbled: The second most common type of device, a cobbled item, is something made of at least two parts and joined together to make a function possible. Let’s say a knowledgable tinkerer has taken a lens mechanism from one device and yanked a control mechanism from a larger console and wired them together. Then she took an old, still-functioning power supply and connected it, and bound it all together with cord. In the end, she’s created a high-powered nightvision telescope and range finder, assuming the user–through a bit of practice and trial and error–can decipher some of the symbols to understand the distances shown in the readout. Bonded: This is where the setting itself starts to intrude on the items. Because realistically, people in the Ninth World are going to start to take found items and make them their own. A scavenger might have found a device that fires a beam of high-powered energy, but when he sells it to a member of the Jagged Dream, a fanatical cult, they get a smith to fashion an intimidating housing around the device, complete with an easy-to-use hand-grip, trigger mechanism, and even a spiked blade on the front should the wielder enter close-combat. Then, one of their artisans etches their unique iconography into the housing, blade, and grip, so that in the end it is a stylish (albeit strange) and likely intimidating weapon. In other words, bonded items no longer look like something found in a trash-heap. They are beautiful (or terrifying, or whatever the craftsman wants). They are incorporated into other items. They are named. They might even come with written instructions on their use. Fashioned: Rarest but in some ways perhaps most exciting (from a setting point of view), fashioned items are devices based on ancient technology but created by people of the Ninth World. Imagine a clave of aeon priests who have studied in an ancient laboratory for years (perhaps generations) and finally determined how to recreate an “elixir” they discovered which speeds up wound closure and tissue knitting by an order of magnitude or more. The compounds needed are rare and difficult to attain, but with them they can begin to manufacture small amounts of this concoction on their own. Years later, they open houses of healing that are known and respected by all in the region. I say that this is the most “exciting” type of item from the point of view of the setting because it is, in fact, exactly what the core story of Numenera is: taking from the past in order to build a new future. The original ways of looking at technology in Numenera are still quite valid from a gameplay point of view, but from a setting point of view, it’s useful to have these categories as well.